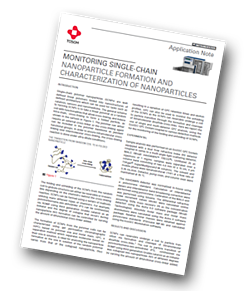 Tosoh Bioscience has produced an application note describing how to monitor single-chain nanoparticle formation and characterize nanoparticles using multi-pore TSKgel GPC columns. Single-chain polymer nanoparticles (SCNPs) are well-defined linear polymers folded into nanostructures of defined architecture, which can be used for tasks such as catalysis, sensors and nanomedicine. The general scheme to forming SCNPs is to take a linear polymer as a random coil with functionalities that allow cross-linking and induce intra-chain, cross-linking to form a folded particle. The polymer can either require an external cross-linker or the cross-linking agent can be included in the polymer backbone as pendant functional groups. In order to ensure intramolecular cross-linking over intermolecular cross-linking, the cross-linking reaction is done under ultra-dilute conditions. The formation of SCNPs from the polymer coils can be characterized using gel permeation chromatography (GPC), based on polymer size and molar mass. GPC, a separation method which separates molecules based on their size in solution, is ideal for analysing the nanoparticle formation as the size in solution of the random polymer varies from that of the collapsed nanoparticle, thus resulting in a variation of GPC retention times and elution profiles. Sample analysis was performed on an EcoSEC GPC System equipped with a dual flow refractive index (RI) detector coupled in series to a multi-angle light scattering detector, MALS (Wyatt miniDAWN™ TREOS®). SCNPs can reversibly undergo a coil to particle transition via formation and cleavage of intramolecular disulfide cross-links. The coil to particle transition of poly(norbornene-exo-anhydride) (P1), synthesized via ROMP using third generation Grubbs catalyst as an initiator was collapsed into nanoparticles (N1) of different degrees by varying the amount of difunctional cross-linker added. The coil and particles were then characterized using the EcoSEC GPC System with dual flow RI via polystyrene relative molar mass averages. the EcoSEC GPC System with a refractive index detector coupled to a multi-angle light scattering detector. 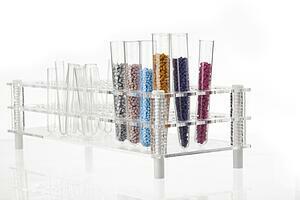 The GPC elution profile was used to monitor the reaction progress and limitations of disulfide linkages formed. The application note demonstrates the versatility of the EcoSEC GPC System when coupled to MALS to determine polymer chain folding and unfolding, and interchain versus intrachain coupling.